What is Viscosity, and Why is Measuring Viscosity Important? Can You Define Viscosity Without Feeling Thick? 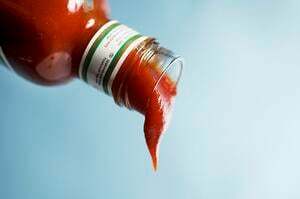 How Can I Measure Viscosity? How Does Surface Tension Relate to Viscosity? Is Consistency Viscosity? Not Really! How Are Consistency, Surface Tension and Viscosity Different? Why Should You Measure Viscosity? Gathering viscosity data on a material gives manufacturers the ability to predict how the material will behave in the real world. For example, if toothpaste does not have the correct viscosity, it can either be too difficult to pump out from the tube, or pump out too much. Knowing the viscosity of a material also affects how the production and transportation processes are designed. CSC Scientific sells Rotational Viscometers that can adapt to the testing method required for measuring the viscosity of Newtonian and Non-Newtonian fluids. We also sell the new EMS-1000 Viscometer, a high-tech electromagnetic spinning viscometer for tricky applications like adhesives, blood, and expensive perfumes. Viscosity is the measure of a substance's resistance to motion under an applied force. The result is typically expressed in centipoise (cP), which is the equivalent of 1 mPa s (millipascal second). Shear stress is the force per unit area required to move one layer of fluid in relation to another. Shear rate is the measure of the change in speed at which intermediate layers move with respect to one another. Isaac Newton, the man to discover this formula, thought that, at a given temperature and shear stress, the viscosity of a fluid would remain constant regardless of changes to the shear rate. He was only partly right. A few fluids, such as water and honey, do behave this way. We call these fluids Newtonian fluids. Most fluids, however, have viscosities that fluctuate depending on the shear rate. These are called Non-Newtonian fluids. There are five types of non-Newtonian fluids: thixotropic, rheopectic, pseudoplastic, dilatant, and plastic. 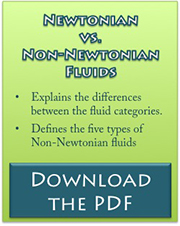 Different considerations are required when measuring each of these fluid types. Viscosity measurements are used in the food industry to maximize production efficiency and cost effectiveness. It affects the rate at which a product travels through a pipe, how long it takes to set or dry, and the time it takes to dispense the fluid into packaging. The production process has to be designed with the viscosity of the product in mind, making sure that pipes are angled to optimize flow, or that dispensers provide the right amount of force to induce flow, but not so much that the packaging will overfill. Viscosity is also a characteristic of the texture of food. The product’s viscosity must be measured and monitored during production to ensure that each batch is consistent and will go through the production process efficiently. To choose the right viscosity for an adhesive, consider how the adhesive must flow, or not flow, on a part after the adhesive is applied. Low-viscosity adhesives will flow more readily than high-viscosity ones, so if you want an adhesive to stay exactly where you put it after dispensing – rather than spread out – a high-viscosity adhesive is ideal. Petroleum: Viscosity measurements project the effectiveness of lubricating oil and determines design elements of pipelines. Concrete: Viscosity determines the self-leveling and pumping behavior of a mix. Cosmetics: Viscosity should be considered when designing the feel and flow of cosmetic products.